LeanSentry monitors and diagnoses your applications out of the box, without the need to instrument them or load any third party dlls. Automatically track more slow operations, including HTTP requests to remote services, MVC actions and views, and the ability to add custom application trackers. 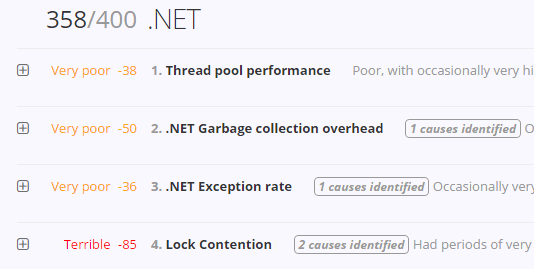 Enable several Performance score rules that proactively measure application scalability and thread performance. Link IIS 500 errors to underlying ASP.NET exceptions. Control how LeanSentry sees your traffic, including ignoring specific requests, and changing the logged client IP or changing the logged url. Read the rest of this article to learn more about monitoring enhancements you can get by deploying the LeanSentry.ApplicationMonitoring.dll library to your application. You can also instrument your code further by referencing the LeanSentry.ApplicationMonitoring.dll library in your code and using the Tracker class. LeanSentry's Proactive performance analysis feature helps your developers discover and fix application performance bottlenecks using best-practice performance analysis rules. Thread pool performance. Tracks the ability of your application to provide threads for request and task processing. Thread workload scalability. Tracks how your application thread usage scales with the workload. LeanSentry tracks errors across your entire application stack, including HTTP.SYS, IIS, ASP.NET, and your application. However, it can be challenging to correlate the IIS errors (for example, HTTP 500.0) with the underlying application exceptions that triggered them. Change url of the request. This can be helpful if you want to combine multiple distinct urls into one virtual url for monitoring purposes, or if you want to modify how the request url appears in LeanSentry. Change the client IP address. LeanSentry.ApplicationMonitoring.dll will automatically replace the client IP with the X-Forwarded-For header if available, but you can also set the client IP manually if it is provided in a different way by your load balancer. Ignore requests. If you do not want to count the request in your statistics, you can set the request to be ignored by LeanSentry. To perform these tasks, reference LeanSentry.ApplicationMonitoring.Monitoring class and use its SetUrl(), SetClientAddress(), and SetIgnore() methods. Please double-check that the libraries are digitally signed by LeanServer LLC before using them in your applications. Follow the instructions below to determine which libraries you will need. Test your application with the library first before deploying to production. Because the libraries are configured to work in multiple environments, you may need to use a slightly different combination of libraries depending on your application. Frequently asked questions about the LeanSentry.ApplicationMonitoring.dll library. WARNING: Enabling startup exceptions will cause any startup errors to break your application. DO NOT publish to production with this setting.